Is it Time to Rethink Your Tattoo Policy? One of the hottest HR topics around the world at the moment is the issue of corporate dress code, and in particular – body art. Most workplaces have a no visible tattoo policy – accompanied by a no visible piercings, brandings, stretchers, tongue splitting, dermal piercings or skin implants policy. The no-ink and piercing policies have been around for a few decades with most businesses. 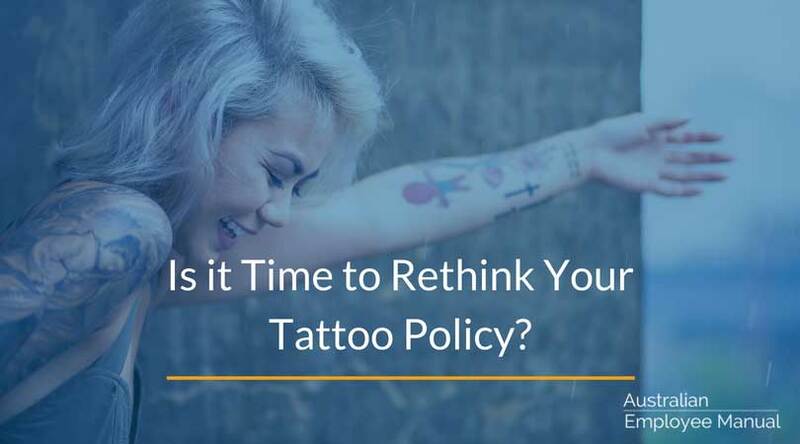 But with an estimated over 12% of all Australians having tattoos and 40% of US thirty something’s having a tattoo, is it time to rethink your HR policies and procedures? 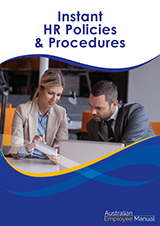 (Our Instant HR Policies & Procedures Manual now gives a range of alternative policies). Traditional tattoo policies did not cause much grief when tattoos and piercings were a sign of rebellion and the owners deliberately choose to be out of mainstream society. But with tattoos becoming common place, stringent policies automatically reduce the qualified applicant pool for vacant roles in a business. In a tight candidate market for particular skills, can your business afford to potentially exclude 40% of all candidates? If you are considering relaxing your piercing and tattoo policy in the workplace, here are a few things to consider. The over-arching policy needs to be that people are hired on merit on the basis of their capability to perform the duties and tasks in the role. The issue then becomes how is capability affected by ink or the piercing? To assess the impact of ink or piercings, you will need to consider your client base and demographics. Typically younger people have fewer problems with inked or pierced service staff than older people. More traditional careers such as law have a lower ink or piercing tolerance than trades. If your clients object, then you may have trouble with relaxing your policy. If you decide that ink is ok in principle, you then need to consider if there certain types of ink or brandings that are unacceptable no matter the capability of the person. You may want to consider banning visible tattoos that are offensive, explicit, reflecting illegal drugs or drug implements, gang related, inciting hate or racism or celebrating crimes. (As a wordsmith I would also add in misspelled words or sayings into this list). The challenge is who will judge whether or not the design is acceptable, and what appeal rights do individuals have? Tattoo location is another area that needs to be considered. Many businesses choose to ban tattoos or piercings on the face, neck or hands. The grey area is that a blanket ban on facial tattoos technically also applies to people with tattooed eyebrows or eyeliner. It also bans people with religious or cultural tattoos such as some people from Maori descent. If you choose to ban facial tattoos, you need to make sure that medical, cultural or religious tattoos are excluded from the ban. As an employer you are required to provide a safe workplace for all employees. Dermal piercings, stretchers and skin implants can increase the risk of personal injury depending on the location and style of the piercing, and the work that is performed. In this situation, WHS must overrule all other considerations. While the focus in this debate is on candidates for vacancies, you also need to have clear policies about existing employees who choose to get tattoos or piercings. Do they need to comply with your policies? Is getting a tattoo or piercing in contravention of your policy grounds for discipline or dismissal? Back in the 1980’s, punk rock brought us extreme hair colours (in contrast to all the grandmas who sported blue or purple rinsed hair throughout the 1960’s and 1970’s). Corporations swung back in response to the bright mohawks, and banned non-natural looking hair colour. Strong hair colour is now increasingly mainstream with streaks of intense colour a regular request at most hairdressing salons. If you want to dip your toe in towards relaxing your rigid dress codes, this may be the easiest one to start with.